Yep, I will try and secure any (easily rescued) items of historical interest over the next few months. Checking through Keith Boles log book today ( he turned 98 ) once he had got back from Singapore he and 30 odd other Singapore refugees undertook a week long pilots refresher course (17-22/4/42) at Levin , the unit named 10B O T Squadron using three or so Oxfords. Does anybody know the meaning of O T.? No. 10 (Bomber) Operational Training Squadron. It later got renamed No. 1 (Bomber) Operational Training Unit. He would have been on one of the earliest courses, if not the first, at No. 10 Squadron. And that unit had exactly 18 Oxfords on strength from the date of its formation (7th March 1942), not just three! And it reached strength of 19 Oxfords by April 1942, but unit establishment (authorised strength) was actually 18. However this number dropped to about 12 - 13 Oxfords by July 1942, as by this time Hudsons were on strength in some numbers, about 6 of 7 of them, later increased to about nine. As Keith Boles was there for only about six days (mighty short time for even a refresher course, perhaps their piloting skills were just being assessed), these were probably the only aircraft he flew personally. Unfortunately the notes I have for 10 BOTS do not tell us the planned lengths for these courses, but the planned trainee strength was 24 multi-engine pilots per course. Incidentally No. 11 FOTS (Fighter Operational Training Squadron) was formed on same date at Ohakea, strength of 18 Harvards, also courses of 24 single-engine pilots. I have an idea that these refresher courses were intended to run for perhaps 4 - 6 weeks. No. 11 FOTS was later (about July 1942) re-designated as No. 2 (Fighter) OTU. Thanks Dave , I will let him know. A week after Levin he was in charge of 53 AOs and 45 Wop/AGs on the Uraguay bound for Canada , and Keith onto the UK. The other question faced today was from Arthur Joplin , how small did the Tirpitz look from 15000 ft . As Arthur was flying he couldn't see the target his Kiwi BA was aiming at. Using Google Earth over an oil tanker at Mt Manganui pulled back to 15000 ft the tanker is about 8mm long, not bad to hit it or even get 40 yards away which is where their Tallboy hit. I have printed off a copy for Arthur to see. A few months ago the subject of unfavourable comment because of their dilapidation, the buildings of the Weraroa Boys’ Training Farm have been renovated, altered, and extended almost out of recognition in recent weeks for use as a training depot by the Royal New Zealand Air Force. When work that is still being done is finished there will be accommodation for 400 men, and it is proposed to pass all Air Force recruits through the depot, including the men who are to be-trained in Canada, states the Dominion. The boys who were at the farm have been shifted to another Government farm near Levin. The Air Force has been in occupation about four weeks, during which time the first group of trainees has undergone a three weeks’ course, and a vast amount of work has been done on the buildings and their surroundings. Carpenters, painters, electricians and labourers have been at work on the extremely dilapidated and out-of-date buildings, which are now a convenient and attractive military training establishment quite unlike most barracks and camps into which soldiers are concentrated. In the main building there is now a large hall where 250 men may mess, a kitchen, recreation rooms and lecture rooms. In another building, formerly a store, there are further lecture rooms, and at the rear of the main building three barracks buildings are being constructed. Each is an H-shaped block in which 84 men may sleep in four dormitories and contains bathrooms and drying rooms. One block is already being occupied, another is on the point of occupation, and the third is still incomplete. Seventy-five men will be accommodated in tents similar to Public Works Department tents, two men to a tent. Immediately behind the main building, sheds and outbuildings have been removed and the ground levelled and sealed to provide a small parade ground. The manager’s house has become the officers’ quarters, and the farm office building now is staffed by clerks in blue uniforms. Everything has been renovated and made bright with paint and new flooring coverings, except one building, to which people point to show what the others used to be like. The large swimming pool of the training farm remains for the use of the Air Force trainees. 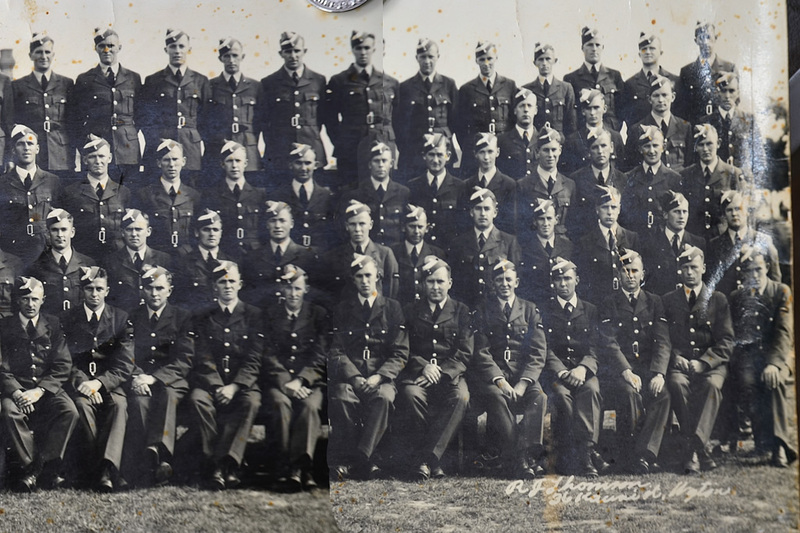 Till now Weraroa has been a ground training school for airmen, but from to-day it will be expanded into the R.N.Z.A.F. training depot with two branches. One branch will be the ground training school, which will give courses for pilots and observers, hitherto the only work of the station; and the other branch will be the recruit training depot, through which men entering all branches of the service will pass. Squadron-Leader T. W. White will continue in charge of the station. Flight-Lieutenant G. A. Nichols, who has been camp adjutant, will take command of the ground training school, and Flight-Lieutenant C N. Rabone will take commend of the recruit training school. Flight-Lieutenant R. G. S. Hale is to be camp adjutant. Rain yesterday afternoon spoiled a military ceremony that would have been unique in New Zealand, the “passing out” from the Royal New Zealand Air Force Training Depot at Weraroa, Levin, of the first batch of trainees. It had been intended that military ceremonial lasting 20 minutes be held on the football ground, but drenching rain made it impossible to carry out manoeuvres on the grass with pleasure, while few spectators would have cared to watch. Instead, a review by Group-Captain L. M. Isitt, Acting-Chief of the Air Staff, and a march past were held on the sealed surface of the parade ground. Group-Captain Isitt addressed the men indoors after the parade, which lasted only a few minutes. Wing-Commander G. G. Olson, who is in charge of training, accompanied Group-Captain Isitt, as also did Flight-Lieutenant C. N. Rabone; Flight-Lieutenant L. G. F. Hale and Captain F. J. Thmopson, M.C. On parade were 140 men under the command of Squadron-Leader T. W. White, officer commanding the station. The Air Force Band from Wellington provided the music. Several hundred spectators, including district residents as well as relatives and friends of the men, watched the parade and inspected the buildings. Group-captain Isitt later expressed himself as very well satisfied with the standard of efficiency set by the trainees. The work of erecting the necessary buildings is proceeding at a rapid pace and within a short time the depot will have accommodation for over 400 trainees. Two Palmerston North trainees at the Weraroa Ground Training School, Messrs. G. F. Halley and K. E. Davidson, have been posted to New Plymouth, as also has Mr R. W. Cowper, of Marton. Dave, you might have to check the initials of the Wing Commander mentioned in second paragraph immediately above. This would have to be Edward (Ted) George Olson, who served with RAF 1926 - 1929, then with aero clubs in NZ, then member NZAF (Territorial) 1930, with No. 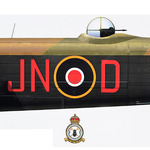 4 AC Sqdn, and finally with RNZAF 1935, till death 15/5/45 New Plymouth. It definitely says G.G. Olson in the newspaper. Wasn't Ted in England a that time? No, E G Olson was DEFINITELY in New Zealand at that stage. To NZAF (Territorial) in rank of F/O from 10/1/30 (seniority antedated to 16/11/27), to F/L w.e.f. 7/3/32, to 4 (AC) Sqdn, NZAF from 10/1/30. Appointed to Regular Air Force (RNZAF) 18/9/35 still as F/L. Granted a SSC commission in RNZAF from 1/1/38 and promoted to rank of S/L w.e.f. from same date (to Temp W/C 1/11/39, to G/C 1/6/42, to Acting Air Commodore 15/11/43). Regular service at Wigram from 18/9/35 (as flying instructor, which had been his civilian occupation), appointed temporary CO of Wigram 19/1 - 1/5/38, then OC Base Hobsonville from 2/5/38 - 29/6/39 (Special note, Hobsonville was known as a Base rather than a Station or an aerodrome up till about 1941, as it was both a land as well as a sea aerodrome, based on RAF practice). 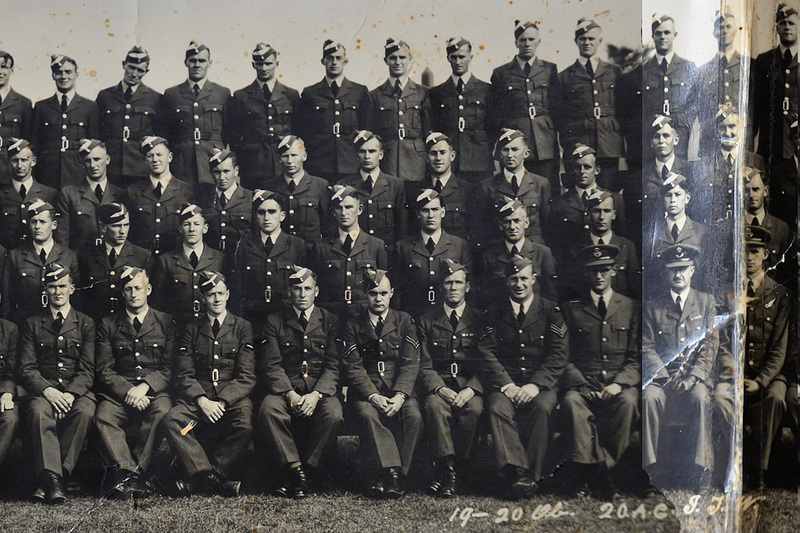 To Air HQ (Wellington 30/6 - 15/10/39, then Acting Air Force Member for Personnel (AMP) @ Air HQ 16/10 - 22/12/39, then Chief Staff Officer, Training (Air HQ, Wgtn) 23/12/39 - 15/3/40, then appointed Air Force Member for Personnel 16/3/40 to 31/3/41. Relinquished appointment as AMP and member of Air Board 1/4/41, not so certain of subsequent movements, but embarked for UK 17/11/41. See also Errol Martyn's For Your Tomorrow, Volume 3, page 377. OK, I guess it must have been him then. Another wonderful group photo from ITW Wereroa (Levin), from March or April of 1941. "March" is written in pencil on the back, and this would fit with some of the enlistment and embarkation dates for individuals in the photo. 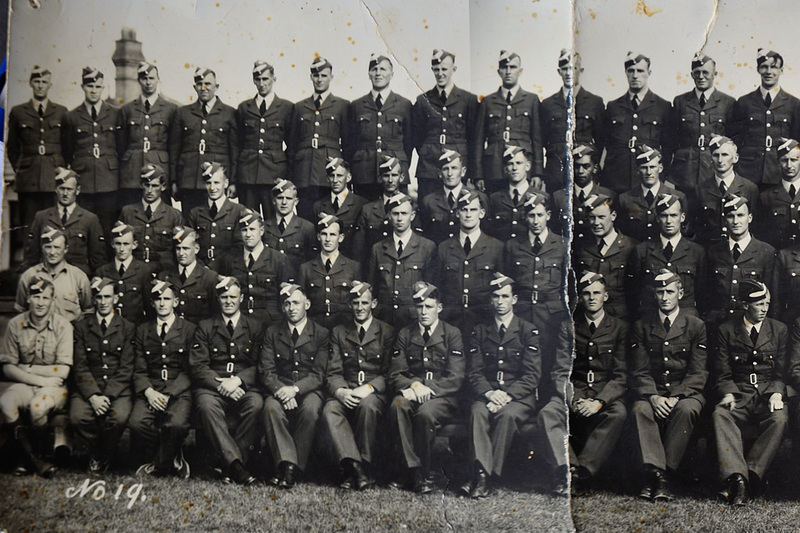 This appears to be a combined class photo, made up of 19 (or possibly 19 and 20) Observers Course, and 20 W/Op - Airgunners Course. It came from the collection of Jack Moller DFM (75 (NZ) and 156 (PFF) Sqdns), and his son, Tony Moller very kindly allowed me to copy it and reproduce it here. Jack trained initially as a Wireless Operator at ITW, and then in Canada, before re-training as a Bomb Aimer in the UK. He is second row from the front, 13th from the left (looking to our right). 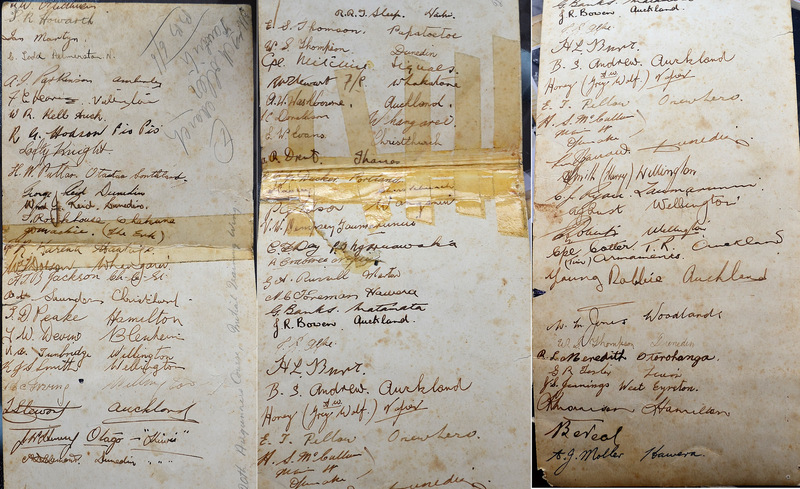 Again, a list of signatures is preserved on the back, although these may only be from the Airgunners Course, going by the inscription. I have tried to decipher the names, and where possible, have used Google to see if I can add more detail. If anyone can fill in any of the gaps, or correct names and/or spellings, that would be great! 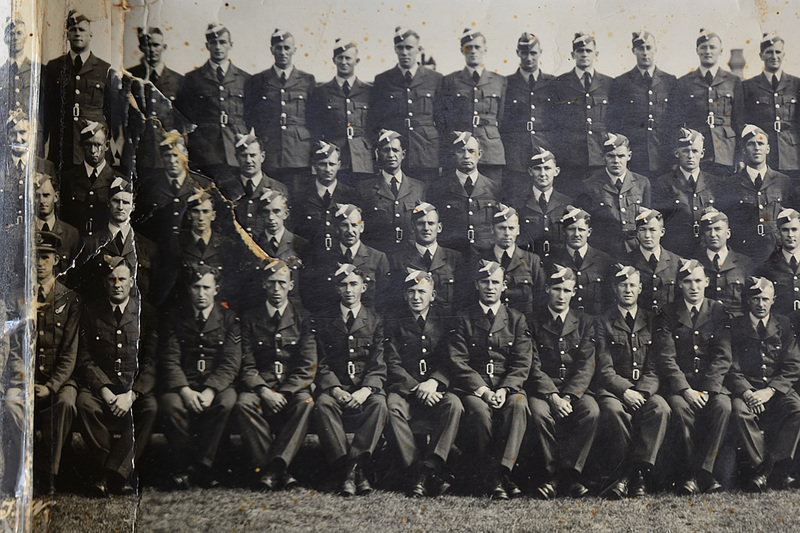 Interestingly, Corporal Timothy Robert Cotter (Instructor, Armaments) appears again - sixteenth from left, front row, and centre front, photo Section 2 - he was also in the Course 30 photo (21 January 1942) above (centre, front). I have split the photo into four sections so individual faces are identifiable. Sorry about the fold!